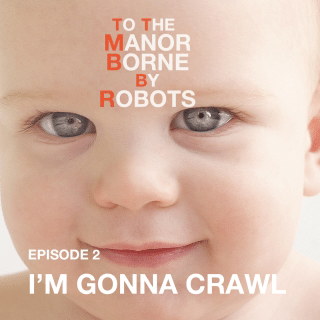 A baby that never ages proves wily beyond his years in I’m Gonna Crawl. Bob has a startling – and slimy – encounter with the Beast. The Master does some 21st century fund-raising, drawing the attention of a powerful CEO. What if you could drive people like drones? Wasted Washington creeper Congressman Steven Guthrie discovers exactly what that might be like in I Smell Burning Hair. Plus the Master takes a swim, and Bob gets a history lesson. 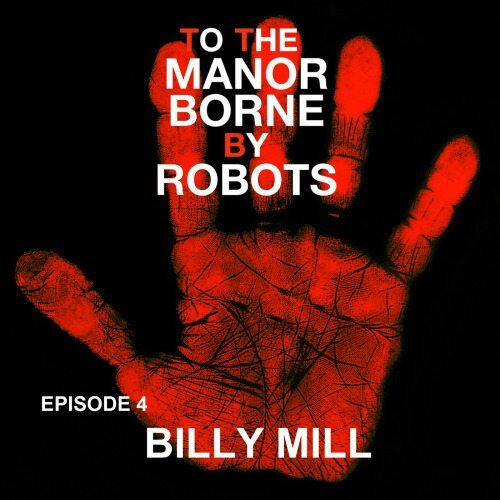 A forgotten song by an obscure musician is the post-apocalypse’s greatest hit in Billy Mill, a story that imagines the last rock band on Earth. 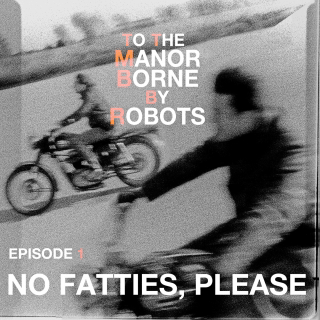 Bob goes to the library, while the Master finds harsh times in the 21st century. 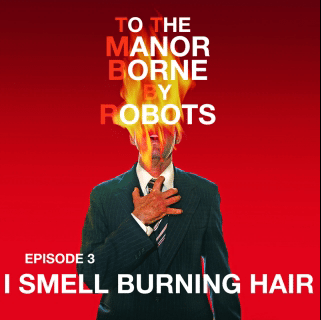 Episode 5 – Who’ll Stop Lorraine? 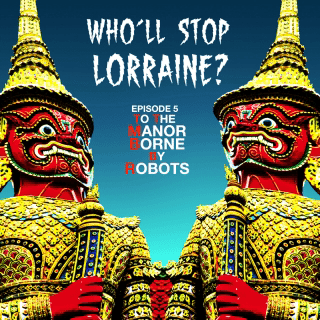 Backpackers battle bloodthirsty spirits on a remote Thai island in Who’ll Stop Lorraine? Bob learns about 25th century relationships. The Master convinces people he’s telling the truth – the hard way. It’s the night before Christmas at the Manor, but the Beast is not asleep. Maybe the Beast would like to hear the tale of Fronsty The Snowman, Frosty The Snowman’s idiot cousin, as narrated by none other than the Metal God himself, the living legend, Judas Priest singer Rob Halford. If that’s not enough, Bob makes travel plans with Tevis. 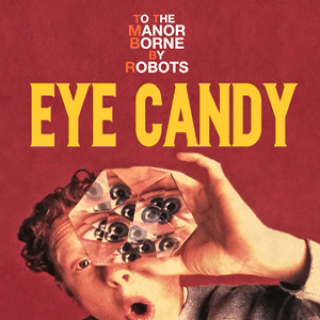 In Eye Candy, a computer in a contact lens is beta-tested by a vicious high school bully. Plus: rubbing shoulders with the 1% at the Davos Economic Conference, and a man of the spirit hears some unpleasant facts. 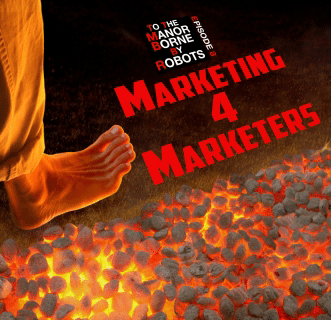 Marketing 4 Marketers ponders a charged meeting between an internet marketing guru and a lascivious demon. The Pope takes a walk and becomes a Green Man. Tevis and the Master get closer, Baller fields calls, and the future ain’t what it used to be. 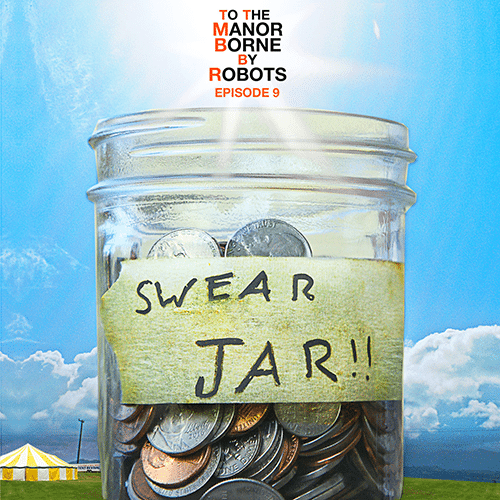 Swear Jar is a sideways sequel to ep. 7’s Eye Candy: an illusion projector falls into the hands of a traveling revival preacher. Meanwhile, the Green Man stops the world, Baller plots revenge, the Master faces change. In the future, Bob and Miss Eloise confront uncomfortable facts. Bob & Miss Eloise must make a baby. Tevis & the Master wrestle with a baffling affliction. The Pope, a.k.a. The Green Man, welcomes Crane & the Chief into his caravan to Jerusalem. 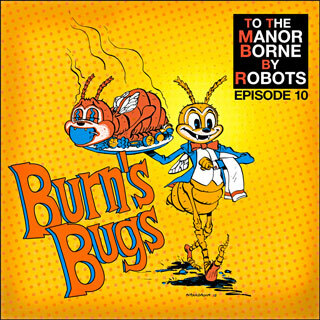 Baller plots against Arcadia head Francis Abercrombie, leading into the stand-alone Burns’s Bugs, in which Arcadia backs billionaire Gary Burns’s bid to feed the world with cheap, edible insect protein. 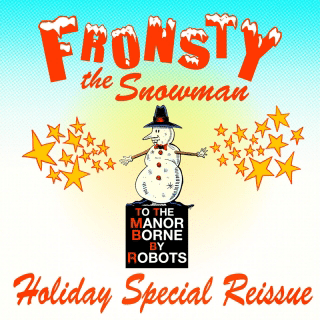 Fronsty The Snowman is re-issued here as a stand-alone piece, minus the story-within-a-story framework of To The Manor Borne By Robots. 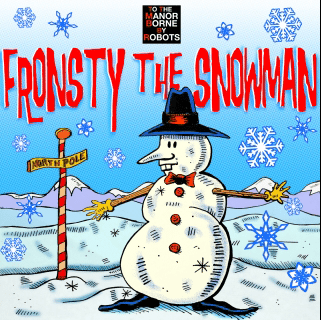 Fronsty is a fun, silly Christmas tale for kids and adults alike (unlike the rest of To The Manor Borne By Robots, which is NSFW). Leading the fray as Fronsty is superstar voice actor Robbie Rist, who began his long career as Cousin Oliver on The Brady Bunch. Aiding and abetting is Feodor Chin, the voice of Zenyatta in the hit game Overwatch, as Fronsty’s elf bestie, Jojo. Narrating this Yuletide yarn is Judas Priest frontman, the Metal God himself, Rob Halford. Merry Christmas from the Manor! !